In the 20th century, Egypt was the first in a series of Arab countries to experience a sudden emergence of nationalism, as it became independent after 2000 years of foreign rule. Turkish music, popular during the rule of the Ottoman Empire in the region, was replaced by national music. Cairo became a center for musical innovation. One of the first female singers to take a secular approach was Umm Kulthum, quickly followed by Lebanese singer Fairuz. Both have been popular through the decades that followed and both are considered legends of Arabic music. During the 1950s and the 1960s, Arabic music began to take on a more Western tone—artists Umm Kulthum and Abdel Halim Hafez along with composers Mohamed Abd al-Wahab and Baligh Hamdi pioneered the use of western instruments in Egyptian music. By the 1970s several other singers had followed suit and a strand of Arabic pop was born. Arabic pop usually consists of Western styled songs with Arabic instruments and lyrics. Melodies are often a mix between Eastern and Western. In 1996,( Amr Diab – Habibi ya Nour El Ain ) was released, becoming a tremendous success not only in the Middle East nor the Arab world but throughout the entire world. The title track, and its English version “Habibi”, was an international phenomenon, becoming a massive crossover hit. In this song Amr Diab has mixed three music civilizations in one track. The Spanish music in flamenco music, French music by accordion solo and Arabic which showed in the playing of drums by Duff instrument and tamphits. This song opened the door in front of Arabic music in the way of internationality and to be popular all over the world. Franco-Arabic music is a popular form of West-meets-East style of music, similar in many respects to modern Arabic Pop. This blend of western and eastern music was popularized by artists such as Dalida (Egypt), Sammy Clarke (Lebanon), and Aldo from Australia. Although Franco-Arabic music includes many forms of cross-cultural blending between the West and the Middle East, musically the genre crosses over many lines as is seen in songs that incorporate Arabic and Italian, Arabic and French and, of course, Arabic and English styles or lyrics. 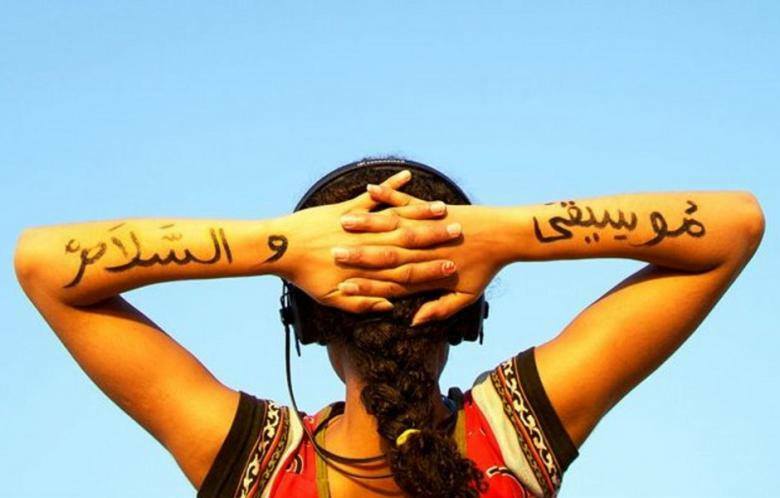 There has also been a rise of R&B, reggae and hip hop influenced Arab music in the past couple of years. These songs usually feature a rapper in a traditional Arab pop song (such as Ishtar’s song ‘Habibi Sawah’). The Moroccan singer Elam Jay developed a contemporary version of the Gnawa genre that is fused with R&B which he named Gnawitone Styla. Another variation of contemporary Gnawa played in Morocco is introduced by Darga. Based in Casablanca, the group fuses Gnawa with Reggae. Political Reggae artists such as TootArd from the occupied Syrian Golan Heights and Walaa Sbeit from Haifa (Originally from Iqrith) started gaining popularity in Palestine in 2011 after the YouTube premiere of a song about the Arab Spring (mainly the Tunisian revolution), called “The Green Revolution”, sung by them and an ensemble of Palestinian artists, most notable among them being Mahmoud Jrere of DAM. Notable is Shadia Mansour, a Palestinian British rapper known as “The First Lady of Arab Hip Hop.” Much of her music focuses on the Palestinian cause. Also there is the Moroccan pop introduced by the Moroccan singer Ryan Belhsen who’s mixing between the American and the Moroccan music in his songs. Electronic dance music is another genre to come out into popularity. Often, songs in this genre would combine electronic musical instruments with traditional Middle Eastern instruments. Artists like Richii popularized this style with songs like “Ana Lubnaneyoun”. Nightclubs in the Arab world that play this kind of music. Another popular form of West meets East, Arabic jazz is also popular, with many songs using jazz instruments. Early jazz influences began with the use of the saxophone by musicians like Samir Suroor, in the “oriental” style. The use of the saxophone in that manner can be found in Abdel Halim Hafez’s songs, as well as Kadim Al Sahir and Rida Al Abdallah today. The first mainstream jazz elements were incorporated into Arabic music by the Rahbani brothers. Fairuz’s later work was almost exclusively made up of jazz songs, composed by her son Ziad Rahbani. Ziad Rahbani also pioneered today’s oriental jazz movement, to which singers including Rima Khcheich, Salma El Mosfi, and (on occasion) Latifa adhere. We can also find a lot of jazz music in Mohamed Mounir’s songs starting from his first album Alemony Eneeki in 1977, and he is considered to be the King of Arabic Jazz and Arabic Music generally. Another notable performer of this genre is the Palestinian singer Reem Kelani who blends Jazz with Arabic music, both in her own compositions and in her arrangements of traditional songs. Arabic Rock has been gaining a lot of attention lately in the Middle East with bands like JadaL and Akher Zapheer of Jordan, Mashrou’ Leila and Meen of Lebanon, Massar Egbari, Sahara, Wyvern and Cartoon Killerz of Egypt, Khalas and Chaos (band) of Palestine and Acrassicauda of Iraq. The band Hoba Hoba Spirit from Morocco is also gaining popularity, especially in the Maghrebi region. Rachid Taha, an Algerian musician, plays a fusion of rock and raï.